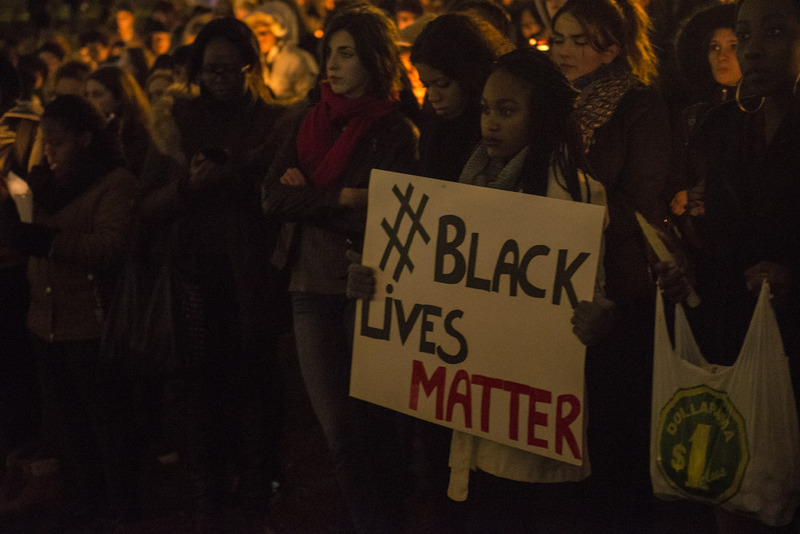 Roughly 500 people showed up in front of the Redpath Museum at McGill University on Tuesday evening to hold a silent vigil in a silent protest against the verdict delivered in Ferguson, MO yesterday afternoon. The grand jury in St Louis County has decided not to indict Darren Wilson, the police officer who shot Michael Brown, the unarmed 18-year-old black youth. The death sparked protests and unrest in the St-Louis Suburb. The vigil was met on the hill by the Redpath Museum, where people of every ethnicity, faith and gender met to hold candles in a silent memoriam for not only Brown, but for all the black youth who were shot and killed by police. It was prefaced by speeches from the McGill Black Students Network and their sister organizations and a reading of several names of youth killed. It was followed by a four minutes of silence. It concluded with speeches from various people from the crowd. One woman decided to remain unnamed stating that the vigil was not about her, but rather about Michael Brown, and one man rapped a segment from Common’s song “A Dream”. One girl even went as far as saying that the verdict scared her and made her reluctant to go visit her family in Washington. The general concensus stood though: give priority to people of color, namely blacks and indigenous. And this remained respected. At the end, the Black Student Network offered their support for anyone who felt uneasy, who felt in need of help or who simply wanted to talk. The crowd dispersed, despite the solemn feeling lingering in the air, with a sense of unity and support towards one another.